1Runcom Technologies Ltd. Submission Eli Sofer, Runcom February 2007 Doc. 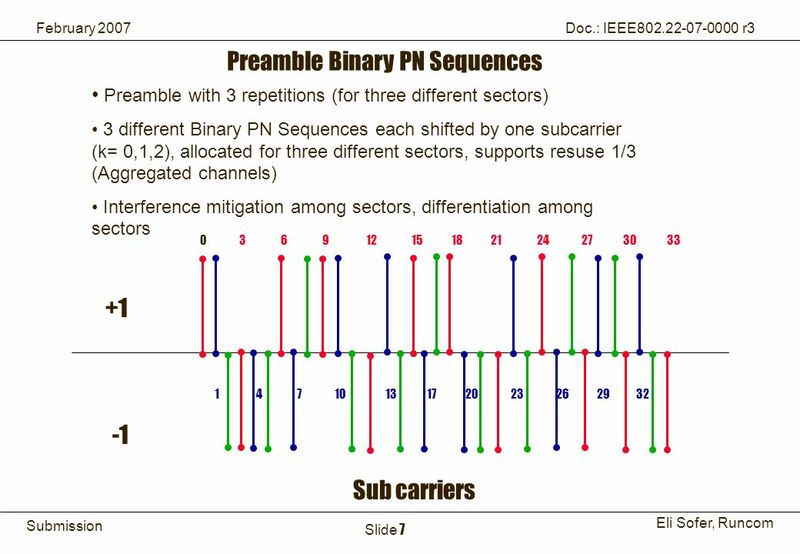 : IEEE802.22-07-0000 r3 Slide 1 OFDMA Single Channel Harmonization IEEE P802.22. 9 9Runcom Technologies Ltd. Submission Eli Sofer, Runcom February 2007 Doc. 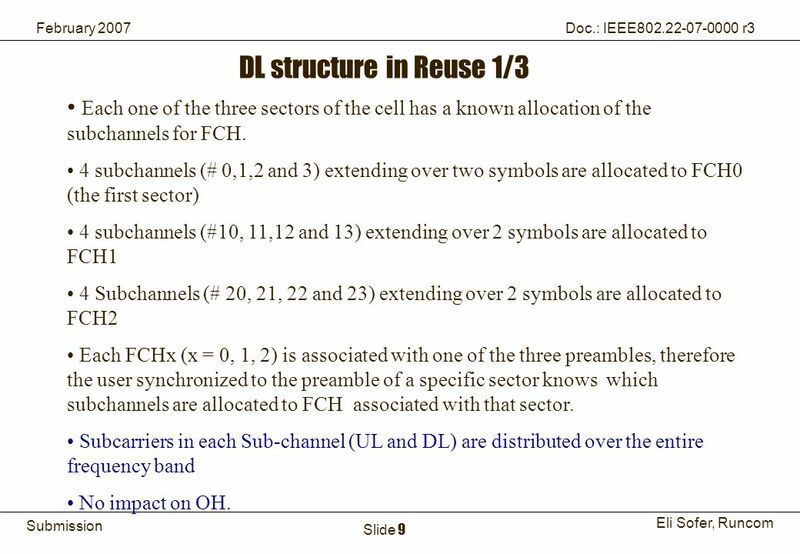 : IEEE802.22-07-0000 r3 Slide 9 DL structure in Reuse 1/3 Each one of the three sectors of the cell has a known allocation of the subchannels for FCH. 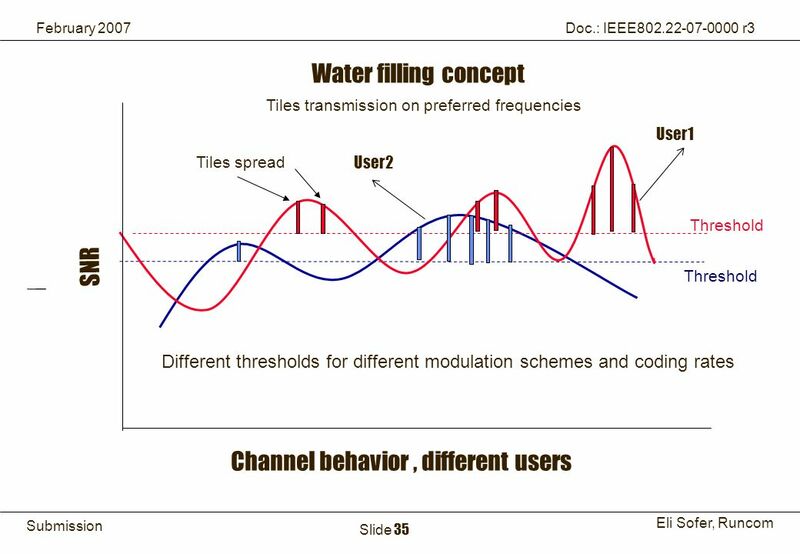 4 subchannels (# 0,1,2 and 3) extending over two symbols are allocated to FCH0 (the first sector) 4 subchannels (#10, 11,12 and 13) extending over 2 symbols are allocated to FCH1 4 Subchannels (# 20, 21, 22 and 23) extending over 2 symbols are allocated to FCH2 Each FCHx (x = 0, 1, 2) is associated with one of the three preambles, therefore the user synchronized to the preamble of a specific sector knows which subchannels are allocated to FCH associated with that sector. 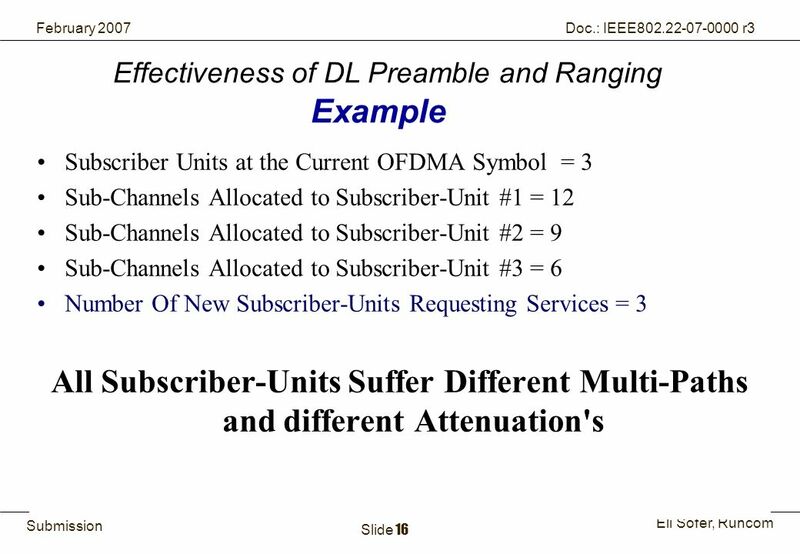 Subcarriers in each Sub-channel (UL and DL) are distributed over the entire frequency band No impact on OH. 24 24Runcom Technologies Ltd. Submission Eli Sofer, Runcom February 2007 Doc. 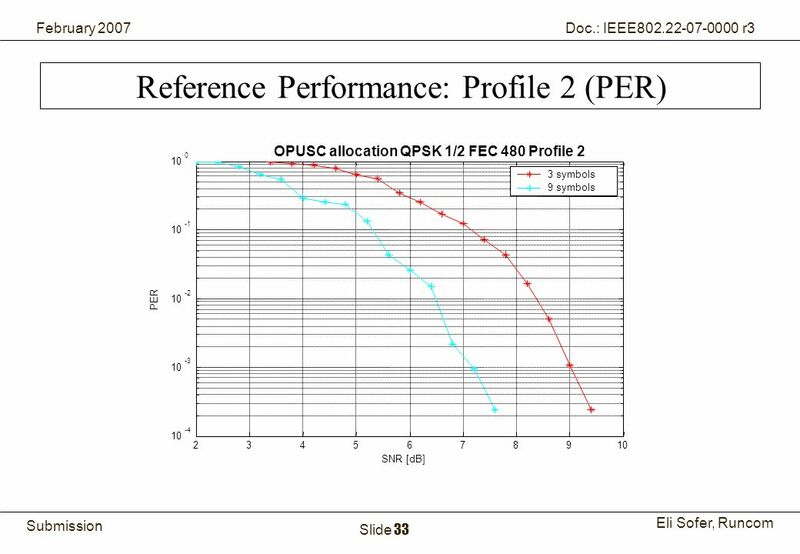 : IEEE802.22-07-0000 r3 Slide 24 Scope The purpose is to present performance of OPUSC scheme to various types of channel estimation methods. 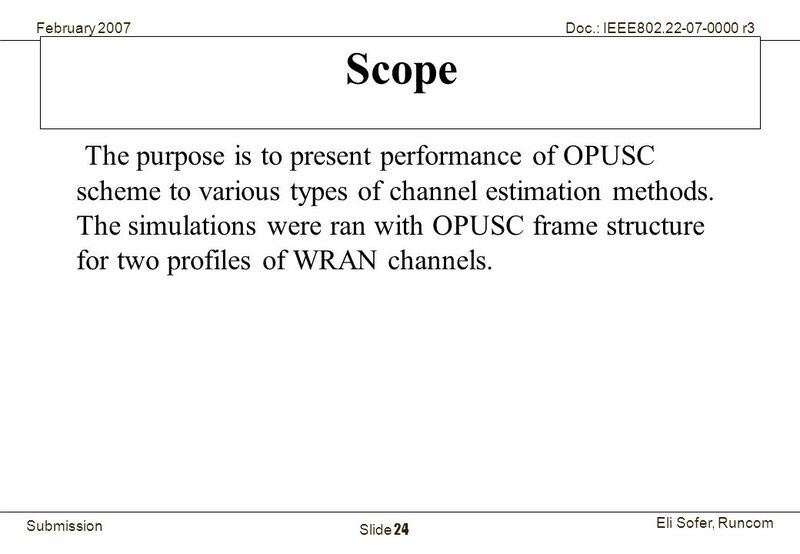 The simulations were ran with OPUSC frame structure for two profiles of WRAN channels. 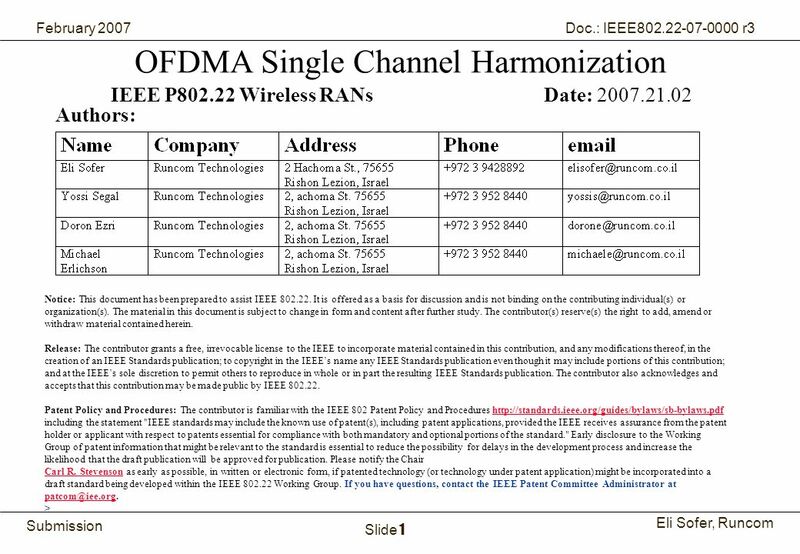 25 25Runcom Technologies Ltd. Submission Eli Sofer, Runcom February 2007 Doc. 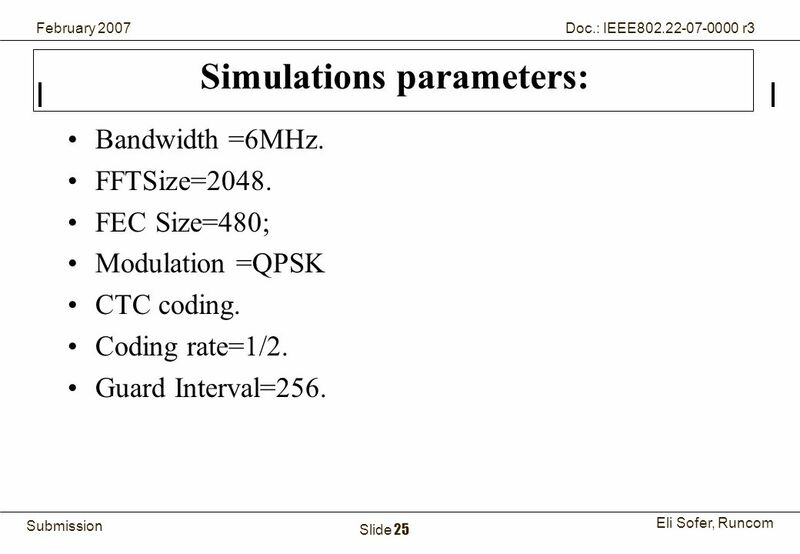 : IEEE802.22-07-0000 r3 Slide 25 Simulations parameters: Bandwidth =6MHz. FFTSize=2048. 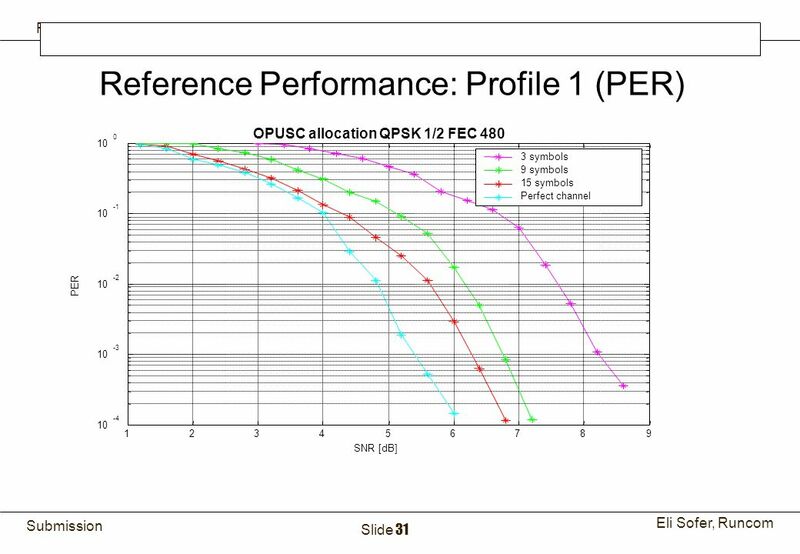 FEC Size=480; Modulation =QPSK CTC coding. Coding rate=1/2. Guard Interval=256. 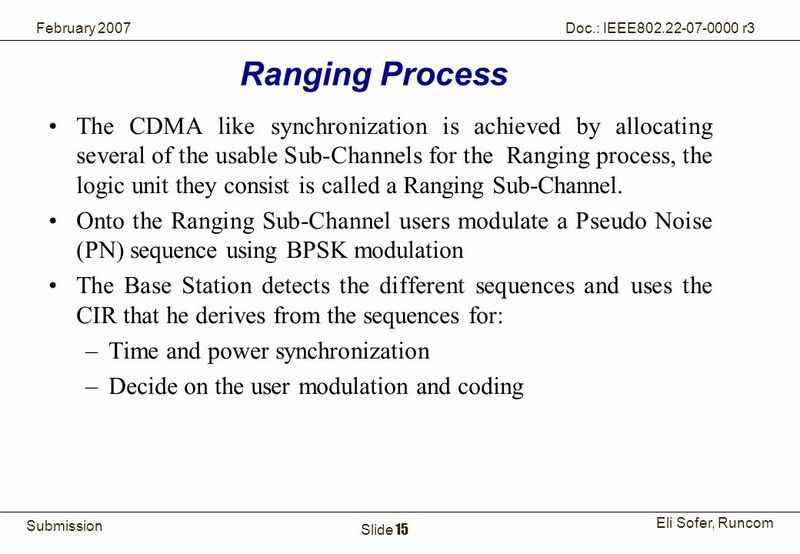 27 27Runcom Technologies Ltd. Submission Eli Sofer, Runcom February 2007 Doc. 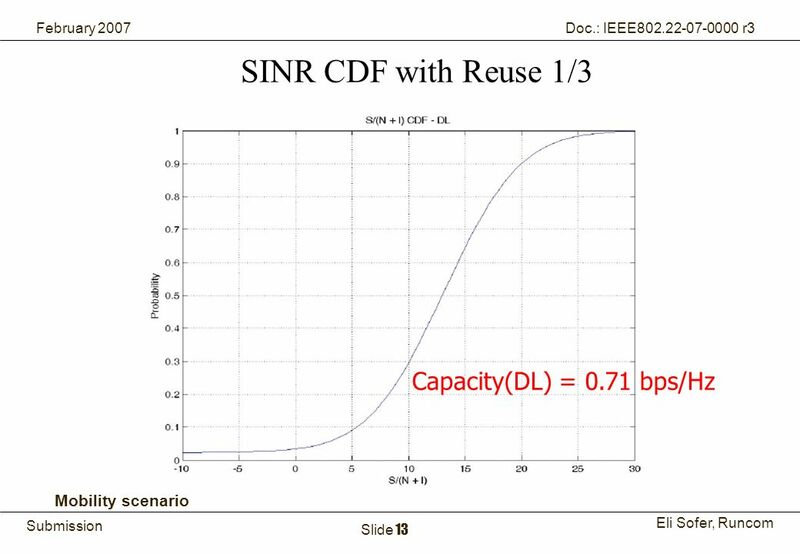 : IEEE802.22-07-0000 r3 Slide 27 Additional assumptions: The simulation were ran without frequency shift and without phase noise. 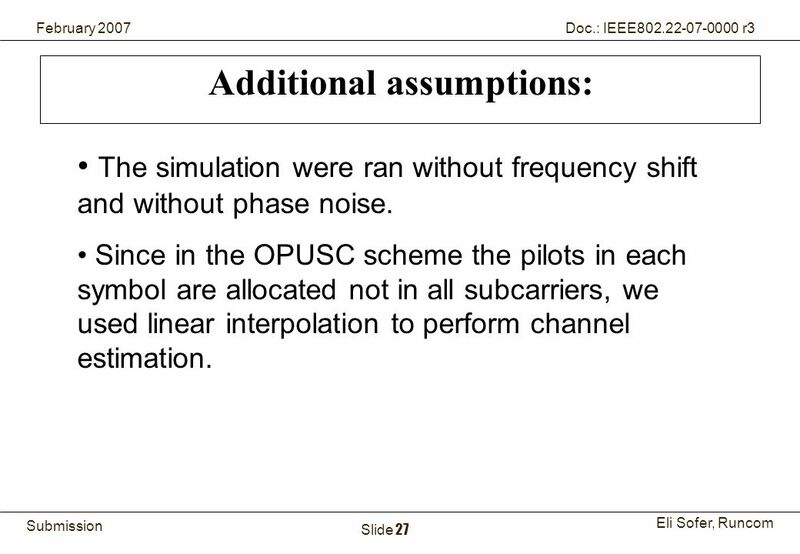 Since in the OPUSC scheme the pilots in each symbol are allocated not in all subcarriers, we used linear interpolation to perform channel estimation. 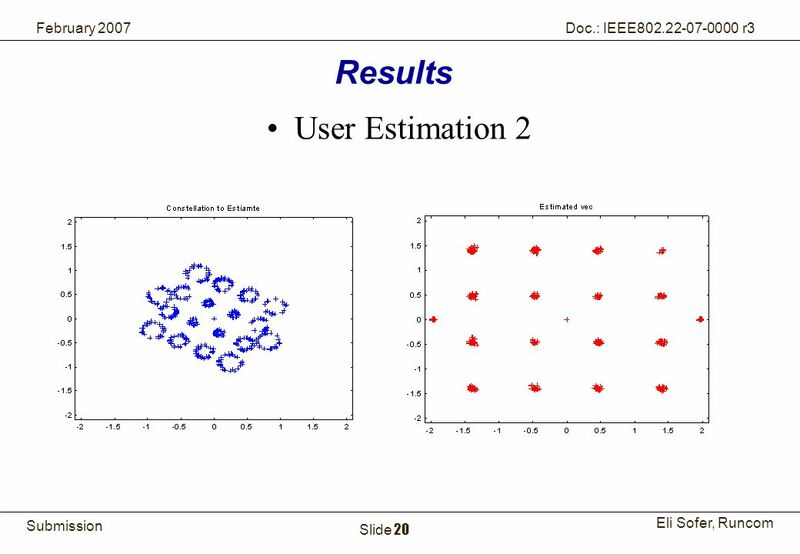 34 34Runcom Technologies Ltd. Submission Eli Sofer, Runcom February 2007 Doc. 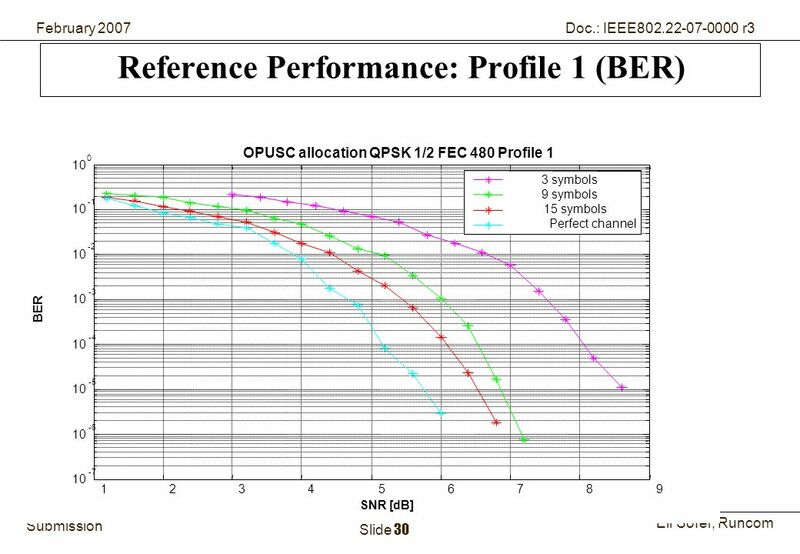 : IEEE802.22-07-0000 r3 Slide 34 Conclusions: The presented graphs show us that we have BER=1e-5 with SNR=9.5. 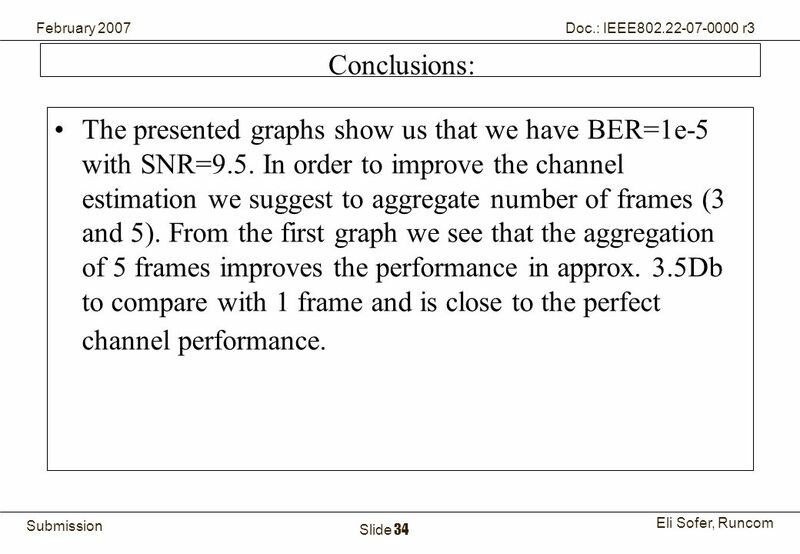 In order to improve the channel estimation we suggest to aggregate number of frames (3 and 5). 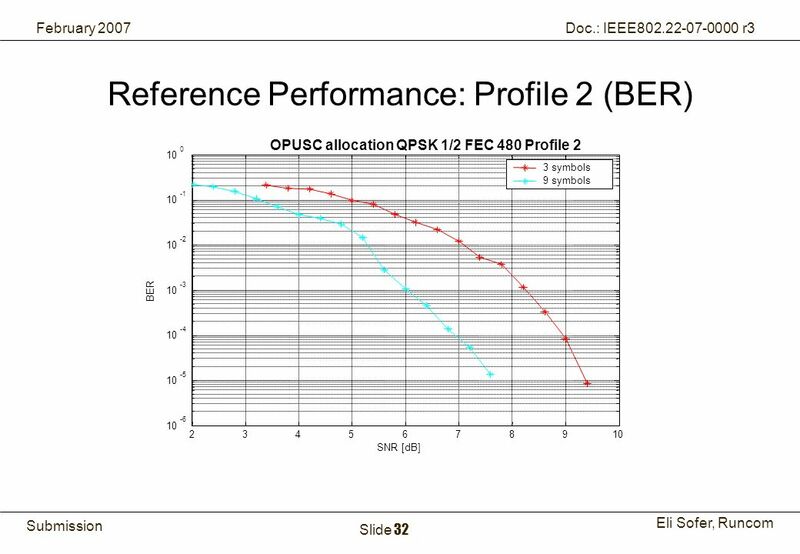 From the first graph we see that the aggregation of 5 frames improves the performance in approx. 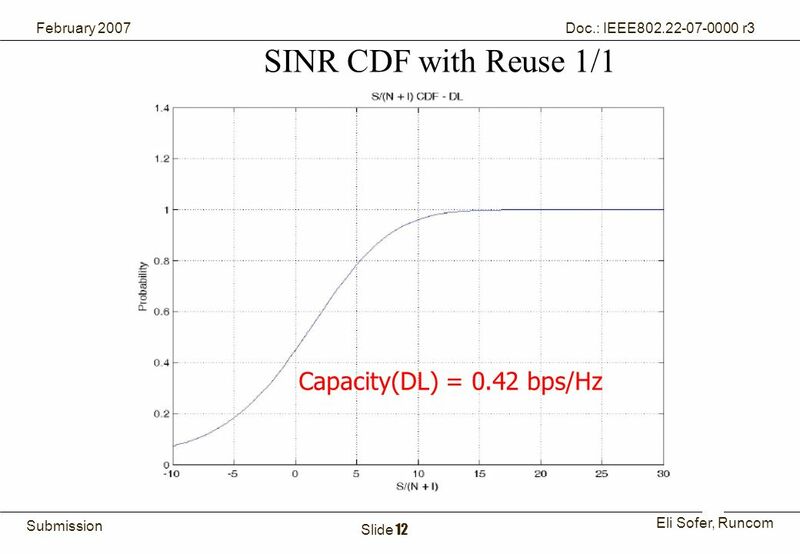 3.5Db to compare with 1 frame and is close to the perfect channel performance. 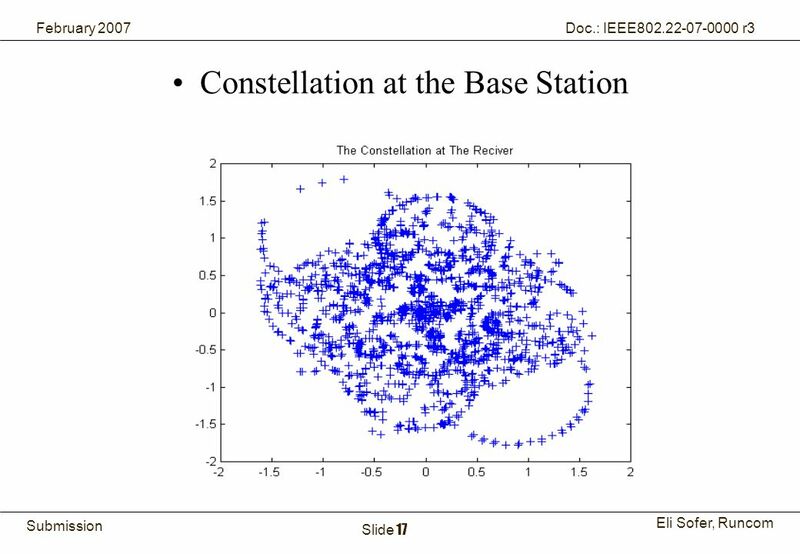 36 36Runcom Technologies Ltd. Submission Eli Sofer, Runcom February 2007 Doc. 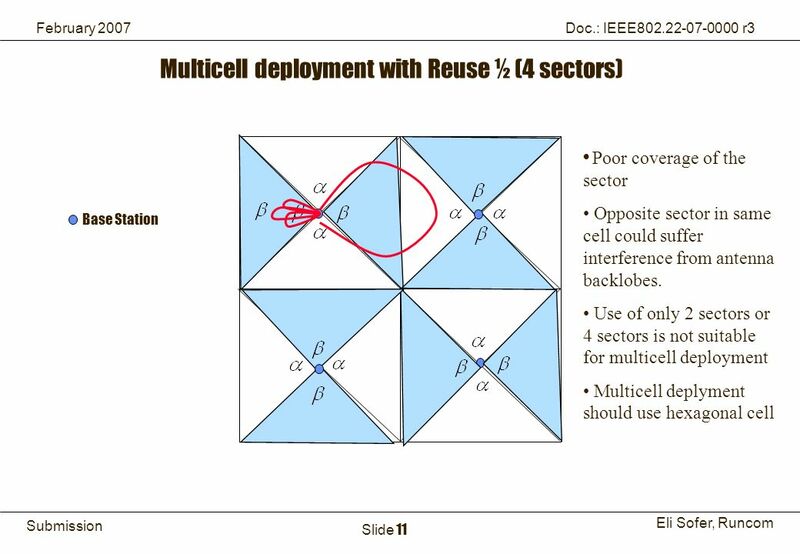 : IEEE802.22-07-0000 r3 Slide 36 Conclusions Preamble with 3 reps is recommended (for 3 different segments), accommodating different deployment scenarios and multi-cell scenarios. 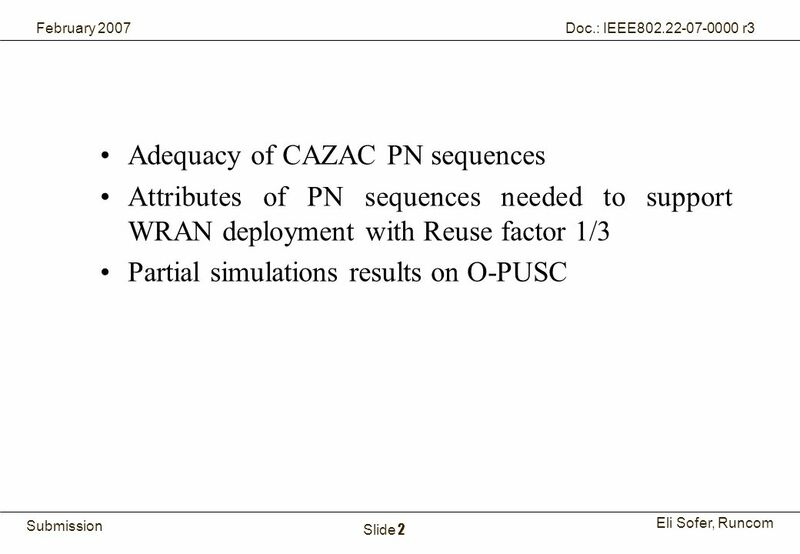 Optional PUSC simulation results so far are poor unless used tiles are transmitted in favorable CINR. 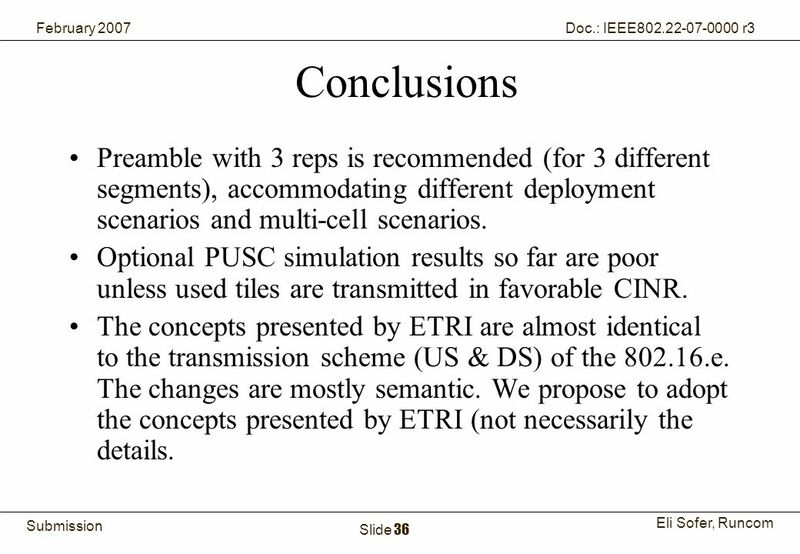 The concepts presented by ETRI are almost identical to the transmission scheme (US & DS) of the 802.16.e. The changes are mostly semantic. We propose to adopt the concepts presented by ETRI (not necessarily the details. 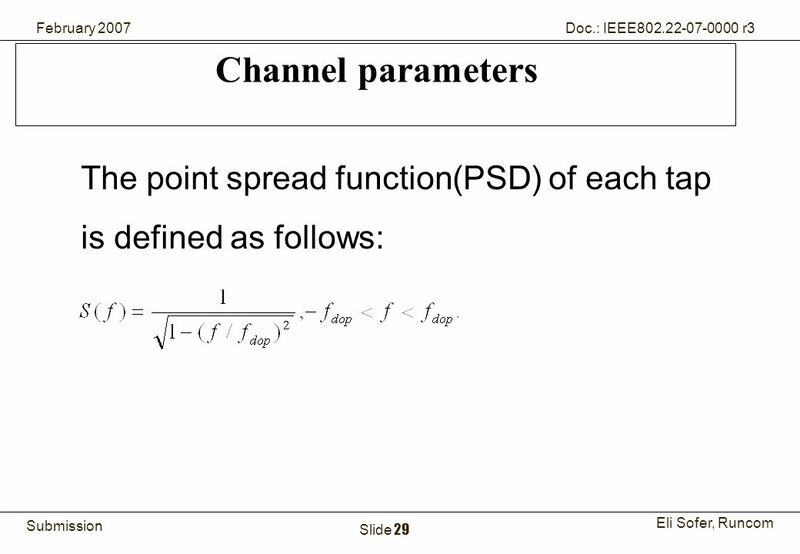 Download ppt "1Runcom Technologies Ltd. Submission Eli Sofer, Runcom February 2007 Doc. 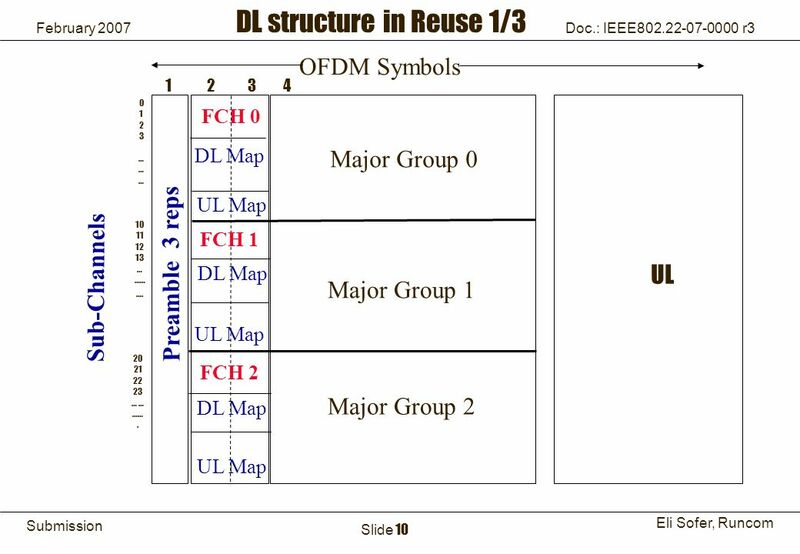 : IEEE802.22-07-0000 r3 Slide 1 OFDMA Single Channel Harmonization IEEE P802.22." Doc. 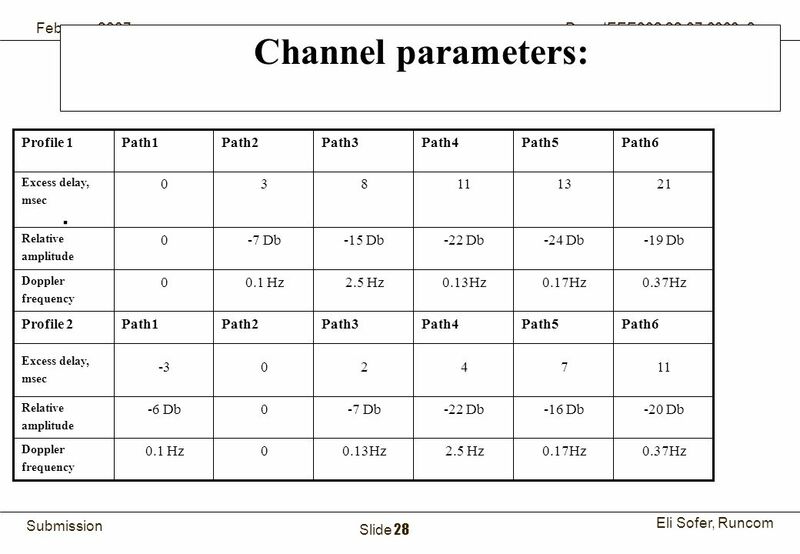 : IEEE /122r0 Submission April 2008 Hou-Shin Chen and Wen Gao, Thomson Inc.Slide 1 Spectrum Sensing for DVB-T OFDM Systems IEEE P Wireless. Doc. 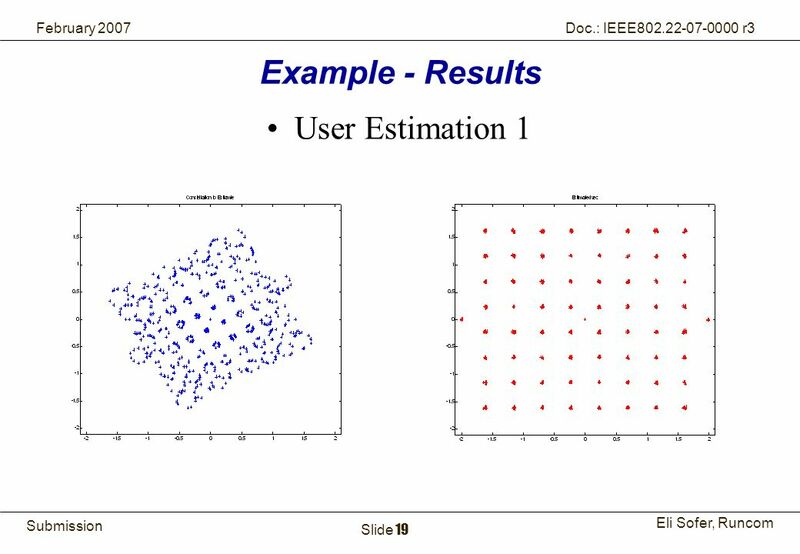 : IEEE /0029r0 Submission July 2006 Steve Shellhammer, QualcommSlide 1 Coexistence Scenario – A Pair of Unlicensed Wireless Networks, one. 1Runcom Technologies Ltd. Submission Eli Sofer, Runcom March 2007 Doc. 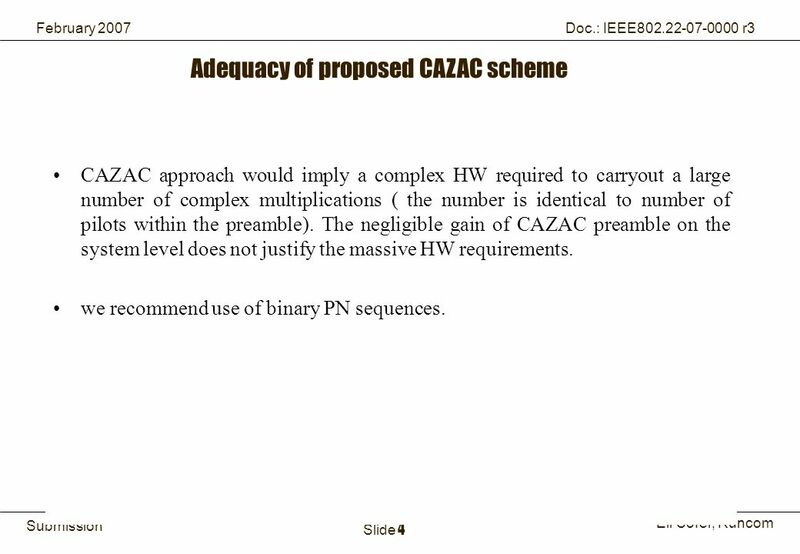 : IEEE /0202r0 Slide 1 Runcom Preamble vs. Phillips Proposed Sequences IEEE. 1Runcom Technologies Ltd. Submission Eli Sofer, Runcom April 2007 Doc. 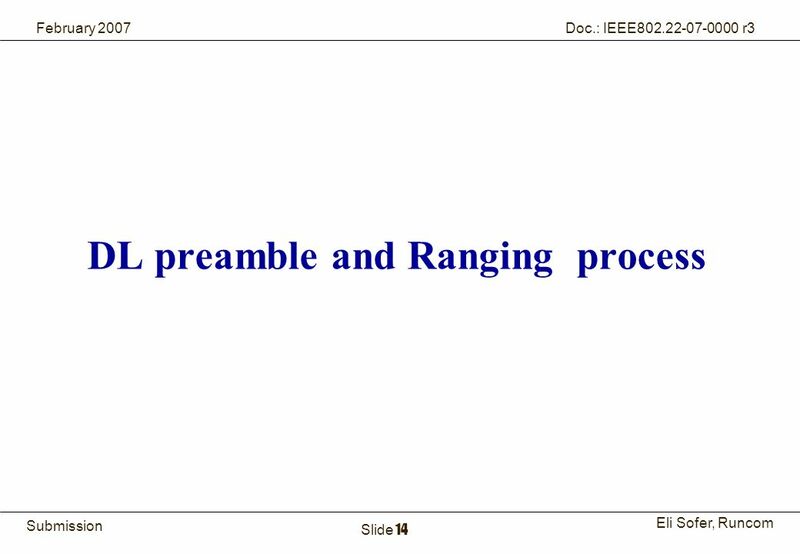 : IEEE /0164r0 Slide 1 Runcom Preamble vs. Phillips Proposed Sequences IEEE. Doc. 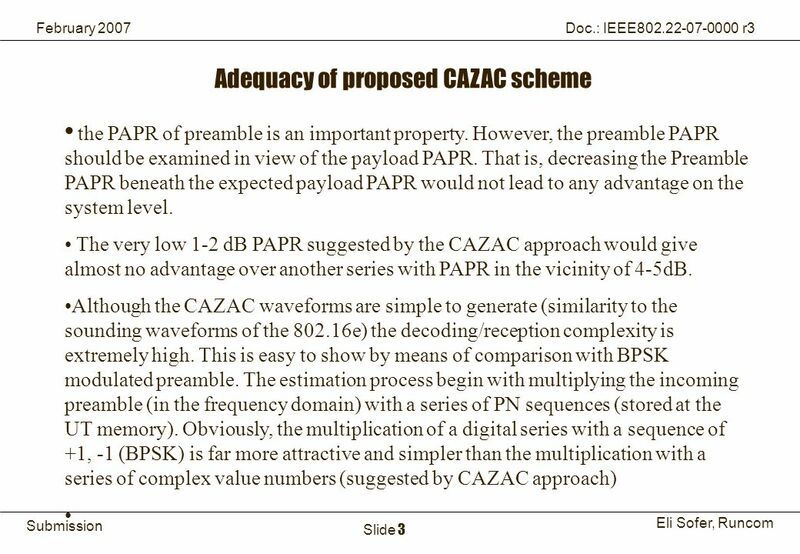 : IEEE /xxxxr0 Submission July 2006 Tom Siep, Cambridge Silicon Radio PlcSlide 1 Discussion of Definitions in 0023r2 Notice: This document. Doc. 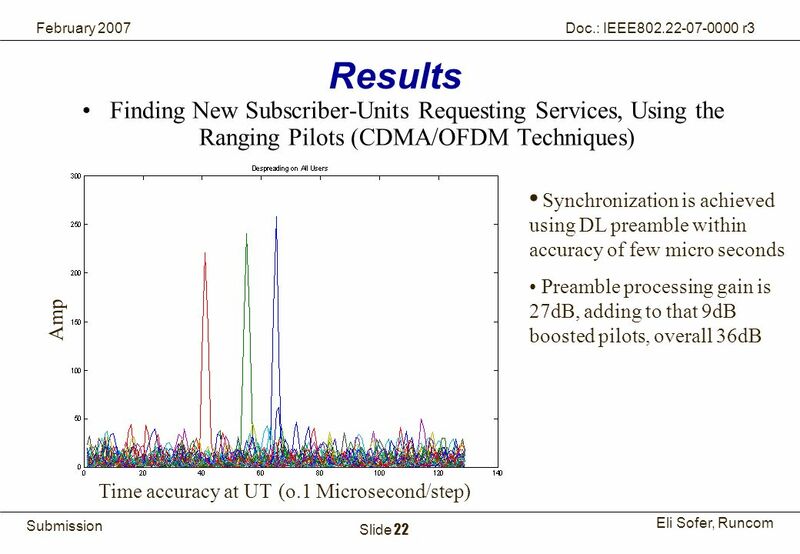 : IEEE /0104r0 Submission March 2008 Stephen Kuffner, MotorolaSlide 1 IEEE Packet Error Rates for MSF1 and MSF2 IEEE P Wireless. Doc. 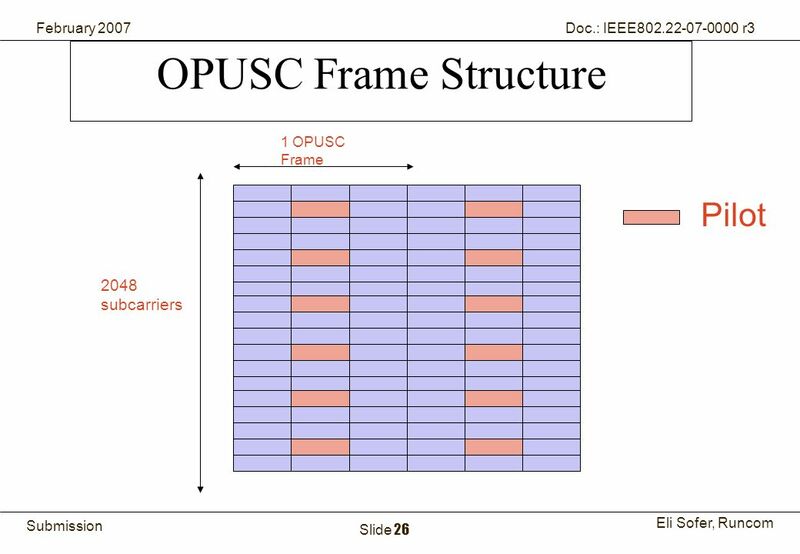 : IEEE /0107r2 Submission July 2006 Baowei Ji, SamsungSlide 1 Uninterrupted Frame Synchronization and Channel Estimation after a Quiet Period/Frame. Doc. 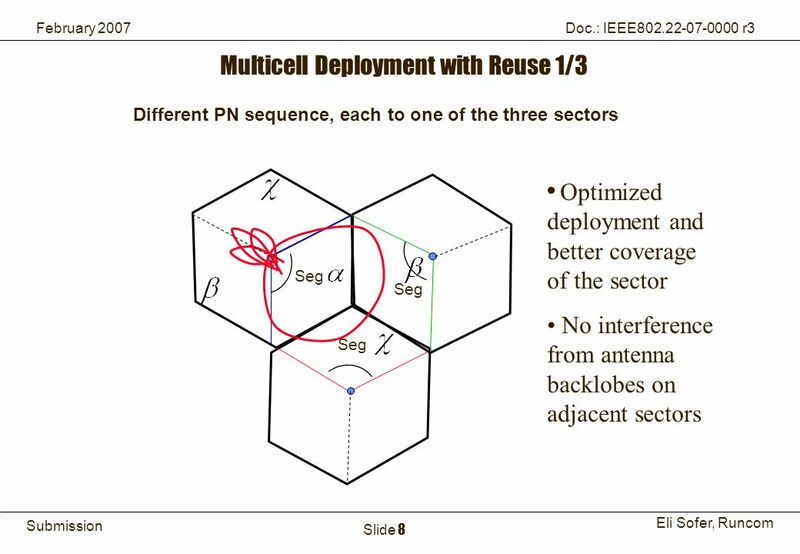 : IEEE /0002r0 Submission December 2006 Soo-Young Chang, Huawei Technologies Slide 1 IEEE P Wireless RANs Date: Notice: This. Doc. 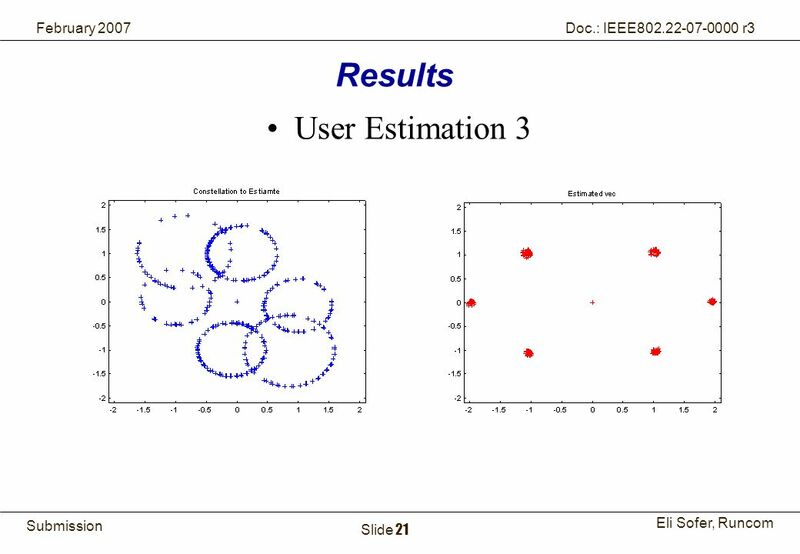 : IEEE / Submission March 2007 Monisha Ghosh, PhilipsSlide 1 DTV Signal Sensing Using Pilot Detection IEEE P Wireless RANs. Doc. 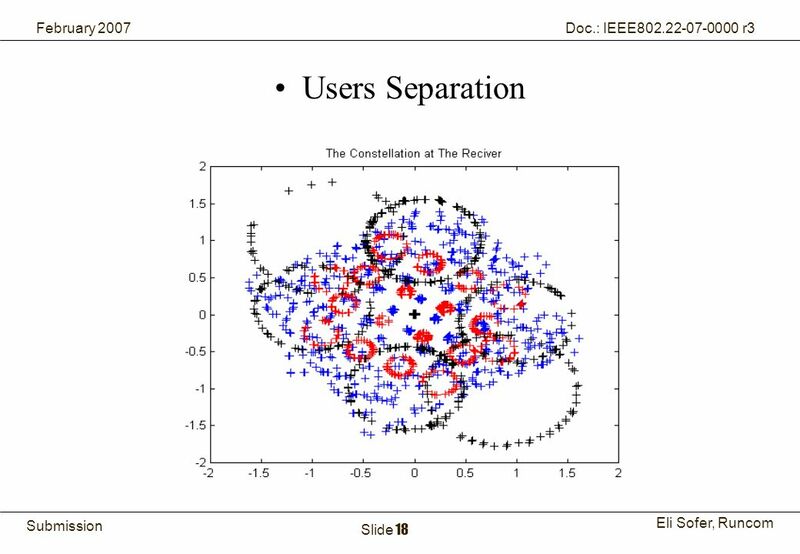 : IEEE 802.19-06/0029r0 Submission July 2006 Steve Shellhammer, QualcommSlide 1 Coexistence Scenario – A Pair of Unlicensed Wireless Networks, one.